This page is about the aircraft F-80A-5. For the other version, see F-80C-10. The F-80A-5 Shooting Star is a Rank V American jet fighter with a battle rating of 6.7 (AB) and 7.0 (RB/SB). It was introduced in Update 1.39. 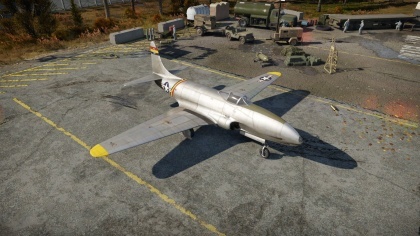 The plane was redesignated from the P-80A-5 to the F-80A-5 in Update 1.79 "Project X". The main purpose of the F-80 is to teach a pilot how to fly jets in general. If a pilot is doing well (read: has even or close to even k/d) in the F-80, he's ready to move to higher tiered jets. Never give up your speed: it is the plane's insurance. Only trade it for altitude in zoom climbs! Be careful that the jet is up-tiered quite a lot. When this happens, strictly adhere to the rules set forth in this article or you will be at a great disadvantage. One thing to take note of is the M2 Brownings. Sadly, they are insufficient for high-speed combat due to the low rate of fire and subsequently limited damage output. This issue is later on fixed with the M3 Browning on the successor F-80C Shooting star, but the ammunition load still remains low, like on the P-51D. As for piston planes: they are capable of setting enemy piston planes on fire in a short burst. All of the guns are mounted in the nose, making them deadly accurate when performing head-ons, especially once the "new 12 mm MGs" modification is installed. For ground attack, there is the usual complement of an ordinance for the USAF: HVAR rockets and standard 1000 lb bombs. This plane must be flown strictly as Boom and Zoom, or Boom and Run. Anything else does not work due the aircraft's awful acceleration. 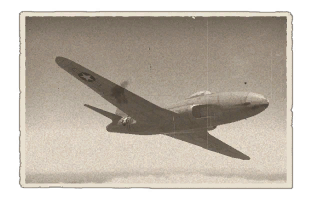 For ground strike, the F-80 is a very good aircraft because of the M2 Brownings mounted in the nose, making it even easier to destroy AAA, light pillboxes and such. At the beginning of the match, the P-80 needs to climb away from the potential combat zone. An altitude of around 3500 m (about 11,500 ft) is sufficient. Then it might head into the battle, after it gained its top speed of around 800 TAS / 700 IAS, both kph, or around 500 TAS / 435 IAS if you use miles. As of 1.73, the F-80 is frequently up-tiered to face off against superior Axis jets in 7.7 and 8.0. Since most of these jets can outrun, out-climb and out-accelerate the F-80, the only way to succeed is to keep your altitude extremely high and to maintain energy discipline. This means no hard turns and not letting the jet slow down too much. The Axis jets can potentially outrun the F-80 even with a 2000 m altitude disadvantage. As with most M2 armed aircraft, the default belts are sub par, so Offensive 12 mm should be focused on first. Due to early jet's bad acceleration, unlocking Compressor and Engine afterwards are crucial. To help F-80's not the best maneuverability, New boosters and then Wings repair are recommended to fix this problem. Afterwards the G-Suit upgrade will come in handy. Fuselage repair and Cover are not really useful and can be ignored until the very end. Four large fuel tanks on each wing. This page was last edited on 31 March 2019, at 01:30.